In school we got our briefs for our recycled garment project - so basically we'll be going around, find things that inspire us, and use this and old garments/materials/objects to transform it into an outfit! So I was gonna be a good girl - stay in and study for my driving theory test, study for school, clean my room - all the stuff Friday nights are for! 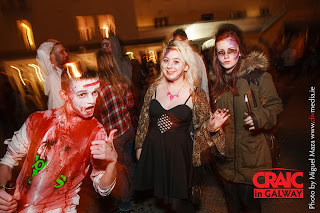 But no, I attended Galway's Fourth Annual Zombie Walk!!!! Yes I dressed up (as a survivor) and headed down to the Spanish Arch with my friends. At 8pm there was already a great crowd down there. I had one of the girls do my makeup and it was FAB! Fair play my huni bee! There were loads of photographers and it was one of those nights were you just meet EVERYONE - there was even a zombie Jesus! At 10pm, with a poster saying "Brains!" on it, we all took to the streets of Galway (from Spanish Arch to Eyre Square). People enjoying their meals outdoors on Quay Street were surprised to say the least! :) Traffic literally stopped for us. Note to self: If one night as a zombie was fun, Zombie Apocalypse will be a RIOT! At Eyre Square there was an unreal fire show. I could never do something like that for fear that my extreme clumsiness would result in the loss of my eyebrows... Oh well! I shall most definitely be attending this event next year! Anyways, after my fail, I attended the Galway Bloggers Party at the House Hotel! It was great stuff :) I was helping at the Cotton Face Vintage stall with the gorgeous Sinead Lally. I saw loads of fashion bloggers walking around and in my head I was like "OMG I READ YOUR BLOG!" - starstruck like the eejit I am! There was also a lovely fashion show (I'll stick up the pics on Facebook) and I loved all the style. It was such a cool experience as well - would definitely go again and suggest that well, everyone goes too!